Those who live in the Southwest are fortunate to not have to deal with the typical weather problems that the rest of the United States experiences. Heavy snowfall, ice, tornados, earthquakes, and hurricanes are just a few examples of the severe weather experienced by a majority of the country. While the sunny and mild fall and winters of the Southwest are fairly easy to prep for, homeowners do need to make sure they are prepared for the strong springtime winds and possible wind roof damage. These are a few simple steps you can take to make sure your roof comes out of this season undamaged from wind roof damage and strong as ever. Spring wind can reach up to 60 mph regularly. These strong gusts can easily break off big branches from trees. 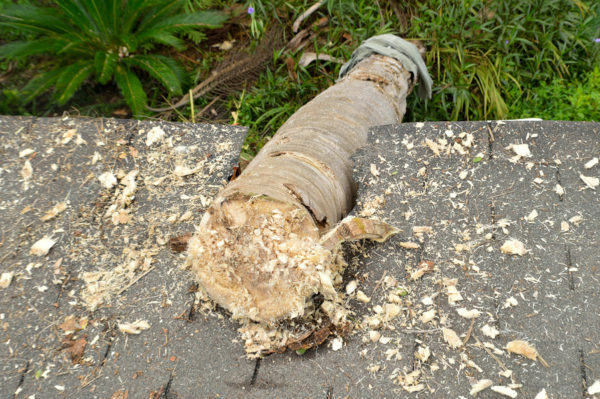 Be sure to keep trees pruned and avoid having trees overhanging the roof. Using gutter straps on your gutters will keep them safe and secure during strong winds. This is important because gutters are not very sturdy on their own. Flashing on a roof are strips of metal placed around any penetration in the roof, such as chimneys or vents. Making sure the flashing is securely in place and without cracks will prevent the wind from ripping the flashing off. Not having secure flashing will cause leaks during a rainfall. Strong winds only worsen existing problems on your roof, so it is important to make sure they are taken care of before the winds strike. Fixing cracks, loose gutters, and leaks will save you from bigger problems to face after the windy season ends. Additionally, the newer the roof is the stronger it will be when facing severe wind storms. If your roof is more than 10 years old, it is a good idea to get it inspected to see if a replacement is necessary. Using these tips can help get you through the windy season in one piece. Here at Atlas Home Repair, we don’t want your roofing problems to get in the way of enjoying the benefits of living in a sunny, warm climate. Call us today if you need help repairing or inspecting your roof for possible wind roof damage at 575-522-0697 or request a free consultation here.